This film of still images is originally an achievement of the city of Clermont-Ferrand to enhance the work of 10 years of photographic residencies on the city. I was in charge of music to the already completed video editing. In residence at "Imago", musical creation center of Clermont Auvergne Métropole, I composed an electroacoustic music in 5.1. My approach was the same as that of a guest photographer in residence. That is, I positioned myself as a discoverer. Delicate thing to do in a city that I live for 10 years. Here is 10 years, that is repeated. 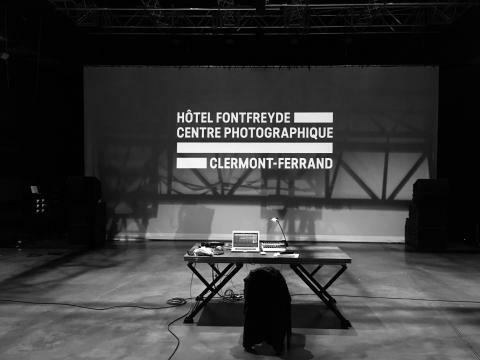 So I first considered the main place where the work of these photographers was done, namely the Fontfreyde Hotel, rue des Gras in Clermont-Ferrand. It is there that I rooted out the first sound material: creaking old wooden floors, whispers of visitors, stone stairs. The second material to interact with the first are from a collection of sounds of argentics cameras made a few years ago. The third material necessary for the facilitation of the common language were made on my synthesizers, at the will of the electronic patches. The choice of the sound diffusion format in 5.1 was done in order to balance the weight of the image and the weight of the sound in the perception of the spectator. It also allows a wider variety of writing of sound in space, as the work is then played without musical monitoring (automation of the diffusion allowing a looping reading in the art galleries). Commissioned by the Festival Musiques Démesurées, a collaboration with the City of Clermont Ferrand / Direction of the Culture on the occasion of the 10 years of the photographic residence. First performance at the XIX Festival Musiques Démesurées, November 8, 2017, in Clermont-Ferrand. Distribution file and technical sheet on request. After a first collaboration and a film, Benoît Dhennin & Yoann Sanson have tried to change the usual way of making a film. Yoann gave to Benoît a soundtrack from that Benoît has made images. With the electro-acoustic music, two years were necessary to let images grow and find their relation with sounds. It is a movement, where the spectator is deeply concerned, between images and music, between is own feelings. This work questions the brittleness of the sensitive thresholds, degrees of perception of acoustic and visual spaces returned thanks to the tool, the medium: a microphone, a camera or a hearing aid and glasses. What let us take and which keep? Which share of real one absorbs consciously? This film falls within a navigation stammering between concrete and abstract, connection and disconnection to sensitive human being to his environment, the world. 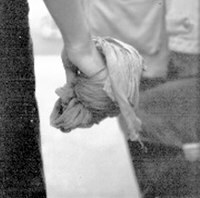 "Je ne vois jamais sans me déplacer"
Experimental documentary related to the student strikes of September 2003 at the University of Mirail (Toulouse). I never see without moving proposes to open spaces usually neglected in a political or artistic and to involve the viewer in these two aspects simultaneously.